In this example, we will using a Brochure Template as an example. Step 1: Choose your template based on the product you need and the size you are looking to have printed. This is example is an 11" x 17" Tri-Fold Brochure. -set the number of pages based on the number of pages in the template PDF. If this is for a 2 sided brochure, then there will be 2 pages. If this is for a 1 sided Postcard, then the number of pages will be one and so on. -Set the page size (Height & Width) to the same size that you wrote down from Adobe Acrobat in step 1. -Make sure that all settings including Gutter, Margins, Bleed & Slug are set to "0". -Check your screen against this screenshot to make sure everything is correct and then click "ok"
Step 7: Once the "Place" window opens up, make sure the "Show Import Options" box at the bottom right hand corner is checked and select your PDF template from PrintPapa ( as shown in the image below). Click "open". 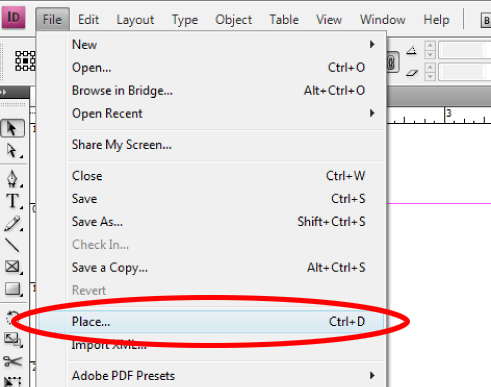 Step 8 : Once you have clicked "open" on the "Place" window the "Place PDF" window will pop up next. In the "Place PDF" window in the "General" section under pages, make sure that the "All" option is selected (as shown in the image below) This is so that you can open both pages one after the other. Click "ok". Step 10: One you have placed the PDFs and aligned them with the edges of the Document, you will want to change the image quality. Do this by clicking ALT+CTRL+H. This should clear the image right up. -In the Layer Options popup - Name the layer "template". Make sure the "Lock Layer" option is selected and the "Print Layer" option is not. (as shown in the image below). Click Ok. Step 13: Get creative and start creating your artwork in the "Artwork" layer. For instructions on creating a Print Ready PDF, Click here.